fracture in which the skin is lacerated and there is an open wound down to the site of the fracture. 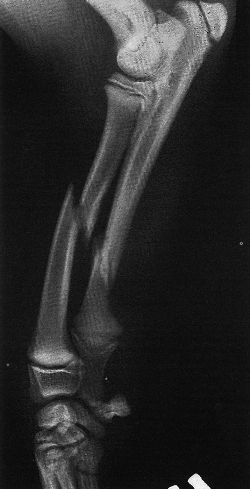 A fracture in which broken bone fragments lacerate soft tissue and protrude through an open wound in the skin. a fracture in which the broken end or ends of the bone have torn through the skin. Also called open fracture. Break in which the skin is perforated and there is an open wound down to the fracture. A bone break with perforation of the skin so that the fracture site has been in contact, however briefly, with the outside environment or the surface of the skin. Such a fracture is infected and requires different management from a non-compound (simple) fracture. breach in continuity of a bone as a result of injury. Known as a closed fracture when there is no break in the skin or open (compound) when there is a wound linking the broken bone to the outside of the body; comminuted when a bone is broken into several pieces, splintered or crushed; complicated when there is injury to surrounding organs and structures; depressed when the broken bone presses on an underlying structure, e.g. brain or lung; impacted when one part of the broken bone is driven into the other; incomplete when the bone is only cracked or fissured, called a greenstick fracture in children. A pathological fracture can occur in abnormal bone (e.g. with a cancerous deposit) as a result of force which would not break a normal bone; also known as a spontaneous fracture when there is no appreciable violence. In the study conducted by Hans P Granhed and Abbas H Karladani on 9 type III compound fracture patients, one patient required the pin replacement and 2 required correction of external fixator. Although there was a paucity of Florida case law regarding this matter prior to Schreiber, (7) cases from several other jurisdictions have held that a compound fracture constitutes a serious bodily injury under analogous circumstances. It allows diverse designs for treating comminuted fractures, permits wound dressing of limb in case of compound fracture, permits local blood flow to the fracture site and provides early return to function of fractured limb (Lewis et al. Lister J 1867b On a new method of treating compound fracture, abscess, etc. The 31-year-old Fiat Yamaha rider finished an incredible fourth at the twisty Sachsenring circuit just six weeks after suffering an horrific compound fracture of his right shin during practice for the Italian Grand Prix at Mugello. A fourth-placed finish capped an amazing comeback weekend from Rossi, who had qualified fifth on Saturday, exactly six weeks after suffering a compound fracture of his right shin in an horrific highside in Italian Grand Prix practice at Mugello. Reigning champion Rossi, 31, suffered a compound fracture to his right leg in a crash at Mugello just 39 days ago but is hoping to be back on the grid at the Sachsenring on Sunday. The Fiat Yamaha rider suffered a compound fracture of his right shinbone when he came off his bike in practice for yesterday's Italian MotoGP at Mugello and spent two-and-a-half hours in surgery. The 25-year-old Croatia international was expected be out for more than a year after suffering a double compound fracture of the left leg in a tackle from Birmingham's Martin Taylor in February. In contrast, a compound fracture, complicated by the most minor puncture wound, could suppurate and the victim would be lucky to get away with his life, let alone his limb. The injury was almost identical to the compound fracture suffered by Coventry City defender David Busst four years earlier and, despite a brave battle, Nilis was forced to retire in January 2001.